The finalists were the novels “The Brass Times” by Slobodan Šnajder, “Alone by the Sea” by Zoran Ferić, “No Signal Area” by Robert Perišić, “Skin-coloured Cloud” by Nebojša Lujanović, and “Your Son Huckleberry Finn” by Bekim Sejranović. The jury of T-portal Award for the best Croatian novel, chaired by a literary critic and a publicist Katarina Luketić, comprised of the translator Ursula Burger, the theatre director Ivica Buljan, and editors and writers Miroslav Mićanović and Jadranka Pintarić, decided to confer this year’s award roman@tportal.hr to Slobodan Šnajder for his novel “The Brass Times”, as was announced during the award presentation ceremony (14-11-2016) at the Zagreb-based Velvet Cafe. The finalists were the novels “The Brass Times” by Slobodan Šnajder, “Alone by the Sea” by Zoran Ferić, “No Signal Area” by Robert Perišić, “Skin-coloured Cloud” by Nebojša Lujanović, and “Your Son Huckleberry Finn” by Bekim Sejranović. The winner Slobodan Šnajder received the award worth HRK 50,000 (7.000$) and the sculpture of the computer keyboard, while the remaining four finalists received Lenovo Tablet Yoga Tab 3. 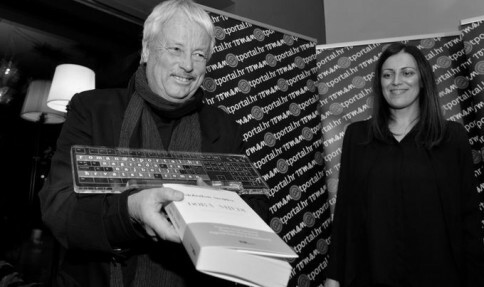 The T-portal award is considered the most prestigious Croatian award given for a novel, especially since its biggest rival, the Jutarnji list prize, has been discontinued. “This year, the jury has particularly enjoyed performing its task, as we were provided the opportunity to read, analyse, and discuss the excellent novels submitted,” noted Katarina Luketić during the winner announcement ceremony of the 9th edition of T-portal competition. “Nevertheless, we also had a highly challenging task to select the best amongst the selected finalists”. When reaching the final decision, the jury relied primarily on the criteria of authenticity and coherence, and they hence opted for Šnajder’s “impressively written novel from the linguistic point of view, almost a novel-fresco, that addresses the issue of oblivion and remembrance, the relationship between a small-scale, intimate and a large-scale, official history in which the author managed to illustrate the completeness of time and space,” stated Luketić. The winner Slobodan Šnajder expressed his gratitude for the award, as well as to t-portal for conferring this award, pointing out that he is extremely delighted with the fact that his novel is this year’s laureate. “Goethe said that upon certain conditions nothing is harder to bear than a succession of fair days. Yet, I’ve been living through the past several good days extremely well,” stated Šnajder. The awarded novel “The Brass Times”, published by TIM press, was announced as a story about love and war whose setting is in Germany in the 18th century, during the time of the great famine and migrations, and it ends in Yugoslavia in 1945 with the persecution of the Germans and ethnic cleansing. The jury of T-portal literary award stated in its explanatory statement that the awarded novel “is a work that will certainly have a significant long-term impact both on the Croatian and the regional literature, and it will hopefully eventually be included in the list of great European novels” and concluded that the novel “shows the complexity of local history and the diversity of our identities, as well as the noxiousness of the policies of national exclusivity that have been striving to erase both such complexity and diversity. Finally, the novel points out the power of fiction to strike back, that is the power of literary language which – as opposed to the language of historiography and politics – succeeds in presenting all the completeness of a certain period of time and space and pointing out the importance of personal choice for the individual”.